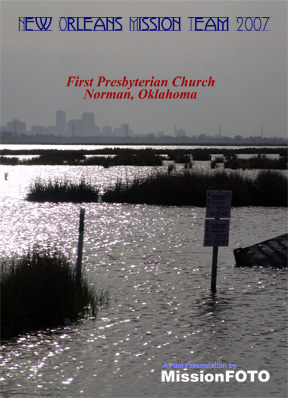 Members of the First Presbyterian Church (FPC) in Norman, OK, who had seen the MissionFOTO film, Hurricane Katrina Relief, asked us to travel with a team working with CrossRoads in the rebuilding of New Orleans. We met the team in East New Orleans and spent the week taping their experiences in the storm ravaged communities. It was a grand experience for MissionFOTO as the group was so excited about being a part of the help to restore and encourage these folks. The interviews of the individual team members that we collected over the week became the highlight of the film we produced. Emotions flowed from the workers as victims of the storm were helped. Mary’s stories captured the hearts and minds of all who met this wonderful lady of 86 years. A five disc set was produced for the church and team members from nine hours of taping on site.